Instead of a huge decline, never reversed, there’s a smaller decline, largely reversed. You can argue that Japan should have done better, continuing to converge on US levels. But the seemingly overwhelming failure you see if you don’t take demography into account just isn’t clear. Quite right. 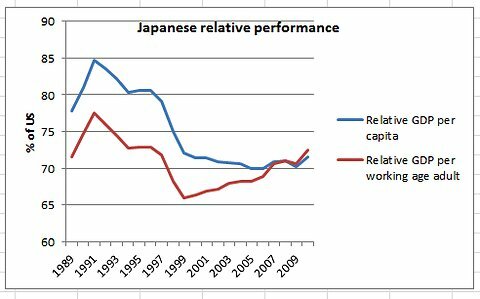 Japan had one lost decade, not two. Now, here's the puzzle. What caused the Japanese growth speedup of 2000-07? The fact that the spending cuts and the growth speedup exactly coincide is probably a coincidence (unless the Confidence Fairy lives in Japan and never visits Europe). But the point is, austerity didn't hurt Japan as much as we might expect, and the 2000-07 boom was definitely not caused by a sudden surge in stimulus spending. So the Koizumi era seems not to have been a Keynesian success story. But does this mean that Japan exported its way out of the recovery (a strategy that is certainly possible when the rest of the world is growing strongly)? No. Note that this chart is exports, not net exports. Imports surged too, so that Japan's net exports - its balance of trade - didn't really change much during the Koizumi years. Nor did the yen's value against the dollar change much overall within this time frame, despite a well-publicized currency intervention in 2004. Then again, Japan's current account balance did rise sharply, though more toward the end of the 2000-7 recovery period. This looks like a big policy change, and it came at the beginning of the 2000-7 recovery period, not the end. On the other hand, as we saw above, Japan remained in or very near deflation for the entire period, and ever since (meaning that NGDP didn't grow anywhere near the 5% that Scott Sumner and others claim is optimal). Also, inflation expectations increased very slightly, but stayed around 1%. So if quantitative easing helped, it did so through means that are not well-understood. That could mean a lot of different things. But it is interesting. A general change in Japanese household saving behavior - The abandonment of long-standing norms of thrift? - might create a "balance sheet boom". Or it might simply be the start of Baby Boomers beginning to retire en masse from the workforce. I need more data. Update: As a commenter pointed out, this is wrong. I had the wrong graph. 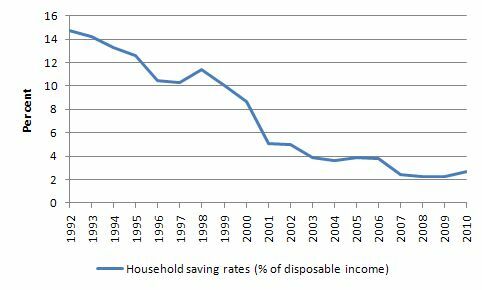 Japan's household savings rate plunged in the 90s but didn't do much in the 2000s. That data is from Hoshi & Kashyap (2011). 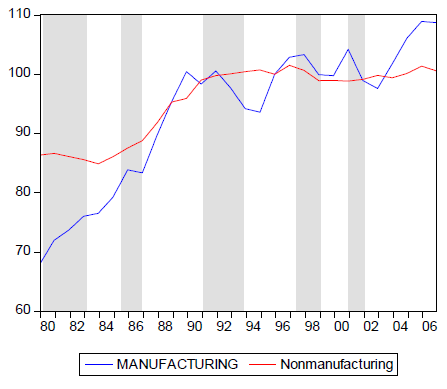 Note that there is a spike in manufacturing TFP from 02-05, so this could have been a driver of the boom. Anyway, to wrap up: During the years of 2000-07, Japan grew quite quickly when measured properly (as GDP/working age population), substantially faster than the United States after accounting for demographics. However, during this entire time, it was stuck deep in a liquidity trap, with government spending decreasing and banks and companies deleveraging. Also, Japan did not experience a major improvement in its balance of trade, nor a large currency depreciation, nor an increase in inflation or inflation expectations. Additionally, Japanese services TFP remained flat. What did happen during the 2000-07 boom included A) an increase in balanced trade, especially with China, B) a steep rise in household borrowing, C) the cleaning up of bad bank loans, D) a possible resumption of growth in manufacturing TFP, and E) a short period of quantitative easing policy. None of these factors seems to jump out at me as the obvious structural causes of the boom, given the above list of things we didn't observe. I guess of this second list, (A) and (B) seem seems like the most intriguing. How about privatization? Does it help explain anything? Also how about financial reforms? The stock market seems to have been boosted by QE, could it have helped a bit the rest of the economy? "E) a short period of quantitative easing policy"
short lived perhaps, but between 2003 - March 2004 the BOJ printed a then unprecedented (in peacetime) 32 trillion yen (about $2,500 for every person in Japan). the MOF, which is the institution which conducts open market ops in Japan, used the 32 trillion yen to purchase approximately $320 billion in U.S. dollar denominated assets. to what effect? it helped slow down the appreciation of the yen, which between 2001-04 only gained 19% against the dollar vs. the euro's 50%+ rise over the same period. that no doubt helped Japanese exports. and for all you conspiracy buffs out there that normally hang ont out on Zerohedge but have ventured over here for a change, it's perhaps noteworthy that the BOJ/MOF action kicked off around the time of Ben Bernanke's visit to Japan in March 2003. Why invoke a conspiracy? Milton Friedman inspired both. How about exports of capital goods? Can it be somehow more special - Germany which is also an exporter of them did pretty well over the same period. "The fact that the austerity and the growth speedup exactly coincide is probably a coincidence"
There was a pause in the long secular decline in hours worked per employed person from about 1998 to 2005 (FRED: JPNAHWEP). There was also a small rise in employment-population ratio (JPNEPP, JPNEPRNA) from 2003 to 2007, and a rise manufacturing employment as a percentage of the total from 2005 to 2007 (JPNPEFANA). This is a picture of increased labour utilisation, reduced hoarding, rather than increased productivity in the Solow residual sense. All the statistics appear to have resumed their secular trends. I guess we'll have to stay tuned. But those things you're talking about are just standard business-cycle correlations...they happen in nearly every boom everywhere. So is the question "why did they happen to a greater extent in Japan than in the USA?" Actually, changes in employment-population were about the same in the two countries. For the other two, the effect was bigger in Japan than the USA. I have a qustion on "Japan grew quite quickly when measured properly (as GDP/working age population"
While I can see that if you have an aging population that GDP/capita would understate growth would not GDP/working age population overstate it ? With a static working population one generally gets growth by increased investment in capital. With a falling working population one could get output growth per worker without increasing the amount of capital at all. 1. At the same time you have population aging, which means more old workers and fewer young ones. That works against the "capital glut" effect. 2. As the dependency ratio rises, people need to do more work outside of the formal sector, taking care of old people. That also tends to depress GDP per working age adult. In any case its clear that there was a marked improvement in performance in the 2000's compared to the 1990's. I might conclude that the govt used fiscal policy to manage unemployment quite well , never letting it get above 5%. "Austerity" in the 2000s was just less fiscal policy being required. Could low interest rates just be a factor of an aging population (a tendency to save more as retirement approaches plus less investment opportunities as the population actually starts to decline)? Perhaps it just took the economy a decade to adjust to an ultra low natural rate due to changing demographics. If so then the 2000's may actually give us a model of how you can get (relatively) good growth in an economy where the demographics keep the interest rates low. This would make sense...if it weren't for prices. Why the heck was there still deflation? Why were interest rates still at the ZLB when Japan was growing faster than the U.S.? Keynesian theory doesn't predict that...I don't know of any kind of theory that does! No, look at the graph I posted of private saving. It goes down, not up. Less saving should put upward pressure on interest rates, higher consumption (and more BOJ money creation to keep rates low) should put upward pressure on prices. Yet...deflation. Perhaps it just took the economy a decade to adjust to an ultra low natural rate due to changing demographics. 1. The household debt to explode with 10 % disposable income added per year, that is one hell of a demand booster. The BoJ to exclude the Shinkin, huuugh ? Like not counting Credit Unions in the US? Or Sparkassen in Germany. 2. TFP in the Service sector is highly misleading. It just means that wages didn't go up. "The Economist" had a similar graph for Germany. Same nonsense. 3. To call a 7% GDP government deficit "austerity" is pretty creative. We didnt do that even through the worst reunification year. It's not just credit growth that matters, it's credit acceleration. Look at your credit growth graph - you have acceleration from 2000-2009: first, a reversal of a decline, then flat, then an incline. Steve Keen is always going on about credit acceleration as a big driver of growth. Also, slightly different results to Krugman with world bank data. I think your update at the bottom makes the most sense... No longer serious adverse shocks. But it's still weird that the ZLB needed to be maintained and that inflation was so utterly absent. Japan had its own "housing bubble" using profits to bid up housing prices to unsustainable levels rather than distributing the profit more broadly. A lot of money was lost. Housing purchased in places other than Japan (like Hawaii) was lost to the Japanese and transferred to other economies. People make bad investments all the time and those get averaged in to the economy with the exception of bubble collapse. Bubble collapse synchronizes the losses. In normal times, losers can get back on their feet and start to make up the losses. After a bubble collapse, losses are so big and losers are so many, the losses cannot be recovered without high inflation to inflate away the losses. This is a major downside to pursuing interest rates that are too close to zero. Is there an opportunity cost into play? Money that should have been distributed more broadly to limit household borrowing or more productively invested into provision of goods and services was instead squandered on bad housing investments with money taken out of circulation by financial interests. Under normal conditions, the monetary authority can regulate money supply and velocity by its actions because leveraging and de-leveraging by private actors averages to near near. The Fed simply tips the scales in one direction or another. After a large bubble collapse, the action of private actors are synchronized. They no longer average zero. The average is so far from zero that it simply overwhelms the ability of a government to level the scales quickly, either by fiscal or monetary policy. The government needs to do all 3: Fiscal Stimulus, Monetary easing and Regulatory policy that writes off bad debts and encourages inflation. Government needs to do a lot of all 3 not a little of one or two. There is an interaction between fiscal, regulatory and monetary policy that is more important than the major effects independently. Because the interaction term is so large, metrics do not correlate well with any single factor. 1. Growth in the US was lousy from 2000-7. So what if growth in Japan was marginally better; it could still have been lousy. How was growth in Japan on an absolute level? 2. The chart compares Japanese growth after adjusting for demographics to US growth. What would happen if you compared J after demo to US after demo (especially in conjunction with #1)? 3. The slope starting at 2000 is definitely positive, but it's not all that steep, particularly if you think of the slope prior to ~1990. Why would it be unreasonable to think that a few small things (listed in A-E) could account for a small increase? "Many macroeconomists and policymakers have debated the effectiveness of the quantitative monetary-easing policy (QMEP) that was introduced in Japan in 2001. This paper measures the effect of the QMEP on aggregate output and prices, and examines its transmission mechanism, based on the vector autoregressive (VAR) methodology. To ascertain the transmission mechanism, we include several financial market variables in the VAR system. The results show that the QMEP increased aggregate output through the stock price channel. This evidence suggests that further injection of base money is effective even when short-term nominal interest rates are at zero." P.S. When has Sumner, or any Market Monetarist, ever said that 5% NGDP growth was optimal for all times and places? 1) The Takenaka Plan and its associated financial reform (esp. splitting of UFJ) was highly successful. Japan now has as well-regulated a financial sector as anywhere. I think you got these pretty well in the final summary of 'the mystery is the 90s'. As always, Hoshi+Kashyap (2011) have the best work on the topic. Taka Ito and Andy Rose's book also covers it nicely. Try Jenny Corbett (ER, 2012) for a summary of the 'mystery'. Oh, and demographics aren't really relevant as both collapse and recovery were short/medium-term variations on a trend. Send me your paper when you have it up online, and I'll blog it! Sounds very cool. Quite right, so you did. And cheers! The population of working age adults in Japan is older than in the United States, and older workers are more productive, are they not? That could explain most of the story. Given all this, my view is that the Japanese experience is best interpreted through the lens of demand. Suppose that we have a crudely Keynesian take on the Japanese slump, in which the downturn was simply a shortfall of aggregate demand. Then the "mystery" of the Japanese expansion is not much of a mystery at all; after all, it wasn't an actual acceleration in GDP growth, just an acceleration in GDP growth relative to labor supply. And in a demand-constrained economy, perhaps there's no reason we should expect changes in supply to matter at all! If households smooth their consumption, then the retirement of elderly workers will leave demand (and therefore demand-constrained GDP) unaffected, while the working-age population decreases. This is roughly what we see in the data. All this is so crudely Keynesian that I'm a bit embarrassed to be writing it, but I do think that it can be embedded in a much more sophisticated model. Envision a riff on Krugman's 1998 BPEA suggestion that the natural rate of interest was low due to the saving needs of an aging population; as the population ages and we approach the new steady-state age distribution, the liquidity trap will naturally abate. I don't find your question intuitive at all. Why would you not compare inflation to capacity? I don't see a compelling reason to think that inflation would be driven by a double ratio of (Japan output/capita)/(US output/capita). If you were looking at changes in prices why wouldn't the first place you look be demand compared to capacity? It's not hard to imagine a situation where capacity was flat, total output was falling, per capita output was rising and working population was declining. "Also, inflation expectations increased very slightly, but stayed around 1%. So if quantitative easing helped, it did so through means that are not well-understood." Maybe QE helped by preventing inflation expectations from dropping further? It's like how the ARRA/stimulus was canceled out by 50 little Hoovers. If you look at the change in the composition of GDP over that period, the trend is clear. Net Exports as a % of GDP increased by 4pts, while Private consumption decreased by 1.8pts and Investment decreased by 2.7%. So my view is that the Yen carry trade, leading to a weaker Yen and higher net exports was a large driver of Japanese growth over that time frame. From 2007 - 2012, the biggest changes to GDP composition has been Private consumption (+2.5%) and Investment, (-2.5%) while Net exports was broadly flat. IMHO, I think the last 5 years are 'normal,' in that the trends in GDP composition will continue, given the demographic challenges. 'Abeconomics' will support growth somewhat, but with net exports already at 2.5% of GDP, and the aggressive monetary policy being discussed a 'one-shot' weapon, the Japan reflation story will probably have a shelf life of not more than two years. Skeptical of your data. Net exports didn't change much over the period, and the yen/dollar exchange rate didn't either. Well, the Yen cheapened vs PPP, right? So even though nominally it was range bound, on a real basis it weakened. There are obviously a lot of issues regarding the proper measurement of net trade. Imports of iPads into the US was cited as a recent example. So I'll allow that this issue probably can't be settled fully at this time. But even if we agree that net exports did not change much, the surge in the current account surplus was supportive, as you noted. For an open economy like Japan, this is a significant event. Even if you disagree with my other points, any explanation for growth during the 2000-7 period would be incomplete with addressing that, IMO. 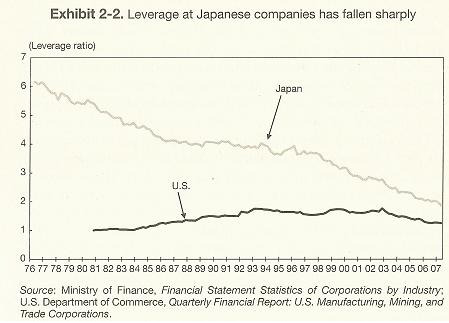 Hmm...this chart shows Japan experiencing a trade deficit for one quarter in '03...really?? That "real effective exchange rate" data is interesting...is that trade-weighted? REER is typically a trade weighted basket, adjusted for inflation differentials. If memory serves, the BIS or World bank once found the that average half-life for currencies to mean revert to its REER is ~7 years. 2) An overview on economic opinion leaders from Kyle Bass oder Adam Posen to Paul Krugman and Richard Koo based on Poscar/Mc Culley terminology. I still have no idea what is being measured here. It seems as likely that you are measuring an increase in the rate of relative population decline, or a change in US productivity as you are anything else. Japan's working age population decline has been accelerating, using the same assumptions used in calculating the productivity numbers would be a clue how much of this is at play. 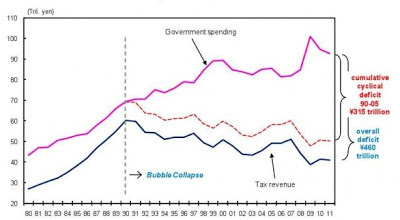 Its also not so clear to me that there was Austerity for the full period, tax revenues quite possibly declined more than government spending though its hard to tell. The intra period rate of change of government borrowing happened at the same point as credit expansion turned positive for the banks, the numbers are percentages so you can't compare relative impact on GDP. I would guess that Japan's private sector began spending more either in slowing rate of paying down debt for corporates or in increasing borrowing for households in response to the boom in Global GDP and this was slightly offset for part of the period, though probably not the whole period by marginally less government spending. This would be consistent with manufacturing productivity rising and the trade story. Not really, no...because Krugman's numbers mean that the remaining working-age population raised its output quite a lot. Imagine if you and I both earn $50,000. GDP per working-age population is $50,000. Now suppose you die. Unless my income increases substantially, GDP per working-age population will remain at $50,000. But the comparison will be the same if you compare Japan to Europe. "But the comparison will be the same if you compare Japan to Europe." Yes, I am suggesting that a significant piece of the relative performance could be explained by productivity. It doesn't take much to increase productivity from a depressed underutilized starting point. This sounds extreme in your example (can we please modify it so it isn't me that dies); but how about an example of a firm with 100 employees that can produce 100 widgets but has only been producing 95, now one person retires and the following year the firm receives orders for 97 widgets. It doesn't seem so implausible to me that the firm would not necessarily have to hire another person. ... exactly - what is being measured here is the question - my last posting was probably somewhat unclear ... I have now compared the following three indicators and depending which one you chose you can tell at least three different stories: a) real GDP PPP per capita - no major difference in growth between the US & Japan in the 2000s, b) real GDP PPP per working age population - Japan is growing faster than the US in the 2000s, c) real GDP PPP per employed - US was growing faster in the 2000s than Japan ... finally, if we compare overall GDP PPP we find the US having strong growth and 175% of the 1988 level in 2011, while Japanese growth was anaemic and in 2011 only at 133% of the 1988 level ... in these comparisons you indirectly always say something about productivity, the demographic and labour market developments in the two countries ... Japan has a stagnating and aging population with falling employment but traditionally low levels of unemployment, while the US has an ever increasing population but cares less about unemployment figures - it is crucial to note that productivity seems to be increasing faster in the US if measured by GDP per employed ... as a result the overall US economy is developing better than the Japanese economy ... one obviously comes at an other conclusion if one looks at GDP per working age population where I would however claim that this rather shows the Japanese love for low unemployment rates ... still Japan's zombie firms effect? i.e., ignore demographics? I refer you to Mr. Krugman. Especially in Japan, which has always been a place where most teenagers do not work. Ah, but this strengthens the puzzle. As the working-age population shrank, it also aged. Older people are less productive. "Sure, but birth rate changes take a couple decades to show up in the working-age population numbers! ;-)"
I don't think there's any mystery at all. The standard monetary explanation fits to a t. There's a nominal shock in early nineties, which coupled with tight money and sticky wages and nominal debt effects lead to rgdp slow down. All the fiscal intervention does nothing to overcome the tight monetary policy, leading to a lot of debt and nothing else. Eventually, the relative prices/wages adjust to the new ngdp path and rdgp growth resumes. In other words, the nominal shock had been processed by the price system. Nothing to explain. Money is neutral in longer term. I also believe there is no mystery in the Koizumi instigated revival. In aggregate, the Koizumi years were characterized by structural reform, as Koizumi's mantra was "no growth without reform". The observation that there was no large currency depreciation is incorrect. While JPY continued to appreciate against USD, by over 10% during the period, the real effective exchange rate as measured by the BoJ depreciated some 40%, to a level not seen since the 1960s. Thus Japan's exports became significantly more competitive. 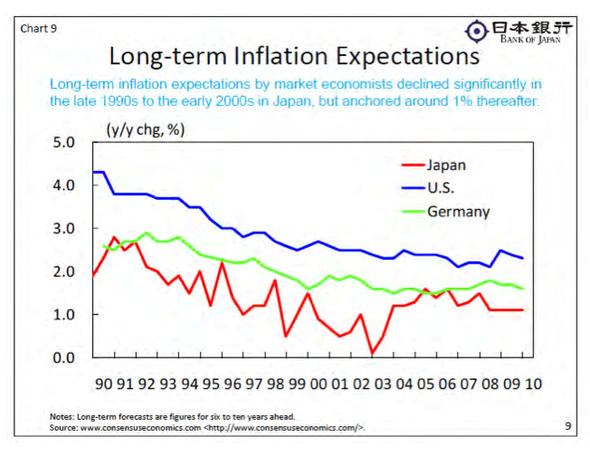 Secondly, the observation that there was no significant increase in inflationary expectations is also off the mark.The BoJ was in the midst of quantitative easing essentially during the entire Koizumi years, expanding bank current account balances from JPY5 trillion in March 2001 to JPY35 trillion by March 2006. This QE was never about stimulating growth, but at keeping the banking system afloat as the Koizumi Administration forced banks to write off/write down their bad loans.The banks parked their ballooning piles of excess cash (from both massive current accounts and deposit growth versus shrinking loan demand) in JGBs, depressing yields. When it became clear after Q2 2003 that the worst of the bank balance sheet crisis was over,the BoJ was confident enough in the viability of the banking system to abandon QE, and collateralized overnight call rates immediately began discounting positive instead of negative inflation. 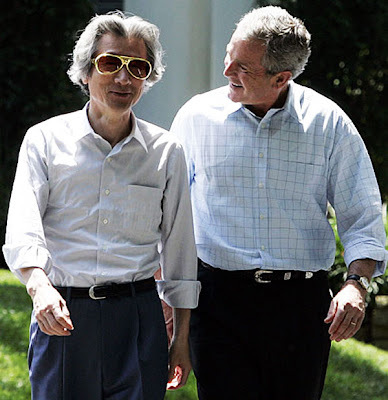 Finally, very few highlight the role the Koizumi reforms had in reversing negative consumer and business sentiment. In addition to removing balance sheet risk uncertainty in the banking sector, the introduction of a REIT market where foreign investors provided massive amounts of non-recourse loan capital fostered a mini-property boom. In addition, promotion of venture capital/entrepreneurial activity, fostered a mini boom in emerging company listings,later vilified by the Livedoor debacle, which came to a head in January 1996 and killed the small cap boom. A close look at the components of nominal GDP growth during the period shows private housing investment and private capital expenditures as showing a significant positive contribution to GDP growth,aided to a lesser degree by net exports and household consumption.In other words, households and businesses felt confident enough to make longer-term commitments.This despite nominal GDP showing basically flat growth overall because of the significant shrinkage in government fixed capital formation (public works expenditures). 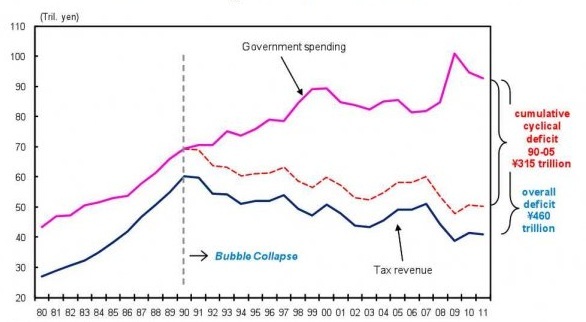 After Koizumi, the reform initiatives fizzled and began reversing, the real effective exchange rate jumped sharply, capital investment and housing investment fizzled, and nominal GDP began to fall again, despite now-positive growth in government expenditures. The raw fact is the change of a ratio and you don't discuss US growth at all. What if the question were why was US growth slower post 2000 ? This would not be hard to answer (to put it mildly). I'd put up a graph of Japanese GDP per working age adult. I'm sure it would show a similar puzzle (I haven't looked at one but you have). My guess about the explanation is roughly the plucked string. It is hard to keep a good economy down (or flat).